Enter the mysterious world of the Japanese geisha in this five-reel jackpot slot from software giant NetEnt. Part of a family of three ‘Wonders’ titles, Geisha Wonders features free spins, wild and scatter symbols as well as two progressive jackpots. This game has been on the scene for many years now and, just like geishas themselves, it still exists to this day. Wonder no more as we take you through the game in this neat review. Play Geisha Wonders for Real Money! 100% Welcome Bonus up to €100 + 100 Extra Spins! Guts Casino, one of the most prominent Irish online casinos on the web, offers players an extremely high quality gambling environment without all the distraction of ads, promotions, or pop-ups. Clutter-free, Guts Casino is a stellar casino offering with simplicity at its core! The geisha is a traditional Japanese hostess trained in skills like dance, music and poetry. The modern geisha is thought to date back to the 18th century and although the phenomenon isn't as common today, it remains an important part of Japan's heritage. When it comes to the game, there are plenty of other nods to Japanese culture too. In the background there’s a Japanese garden with a lake and a geisha woman standing at the side, while the reels include symbols such as Koi carp, a fan, lanterns and a white cat. The scene is light and colourful, with gentle background music that completes the Oriental theme. The base game is fairly simple, with five reels, 30 adjustable paylines and four bet levels. The minimum bet is 1p and the maximum is £60. Unusually, there’s no autoplay function but there is a max bet option. The white cat (considered good luck in Japanese culture) is the highest value symbol on the reels, while the paper lanterns represent the lower value symbols. 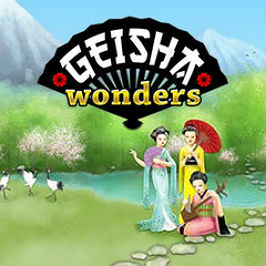 There is no bonus game in Geisha Wonders, though it does offer a free spins feature, which is triggered by landing three, four or five of the geisha scatter symbols. The more you land the more you get, with five rewarding you with 30 free spins. You can trigger even more spins by scoring more scatter symbols, with all wins doubled during this feature. The Buddha is the wild symbol in Geisha Wonders and can provide you with a big boost during the base game. He substitutes for all symbols except the scatter and landing five wilds pays out a massive 10,000 coins. As mentioned, there are not one but two progressive jackpots to play for in Geisha Wonders. These are shared with the other two titles in the NetEnt ‘Wonders’ series, namely Tiki Wonders and Icy Wonders, so you can contribute to the jackpots by playing any of these games. The symbol you’re looking out for is the gold star jackpot symbol. Get four of these on an active payline and you’ll win the Wonder Jackpot. This starts at £5,000 and often goes into the tens of thousands. But it’s the Mega Wonder Jackpot, which is triggered by landing all five of the gold stars, that delivers the really life-changing amounts of money. The top prize regularly goes into the hundreds of thousands and has even been known to reach as high as £750,000. The progressive jackpots, along with the high-variance nature of the game, mean Geisha Wonders is more suited to high rollers. Wins aren’t very regular during the base game but the free spins and the wild keep things interesting. It’s certainly worth persevering with to land one of the progressive jackpots. Ganbatte! Share this Geisha Wonders Review today! If you like Geisha Wonders, you'll love these slot titles too!